A good resistance training plan doesn't have to be complicated, but it should include a few basic tenets. Find out what they are and how to implement them! I started lifting weights in high school to improve my athletic performance. Five days per week, I'd venture into the local gym to haphazardly curl dumbbells and try machines. I'd hammer my legs for 90 minutes, do burnout sets of 15 exercises per workout, or use some other method that had me begging my dad to install toilet grab bars. Magazine workouts became my go-to programs in college. Each month the glossy covers would boast toning, tightening, firming, and slimming exercise routines promising to transform my body in days. I'd try this magazine's workout one day, another workout the next—switching back and forth without understanding form, function, progression, or regression. Basically, I was overwhelmed by information. People new to resistance training may walk into the gym and feel similarly bombarded. All the machines, racks, barbells, dumbbells, kettlebells, and bands may send you running to a safe place like the treadmill or juice bar. I want you to walk into the gym with confidence, knowing what to use, how to use it, and when to use it. By reading and using the following information, you'll walk into the gym with more confidence. You'll understand the necessary parts of a resistance program and how to find the best weight-training plan for your fitness goals. Learn to thrive on simplicity. You can get great results without complicated exercises or routines. Focus on getting stronger and improving your form with each workout. When you do, everything else will just fall into place. It's common for beginners to focus on building muscles through isolation movements. Although isolation exercises have their place and are important if you're trying to be a physique athlete, they're not the most efficient way to burn calories and build strength. Technically, it's impossible to isolate a single muscle, but isolation movements like biceps curls and leg extensions are single-joint exercises. Compound exercises, like the bench press and squat, are multi-joint movements that recruit larger muscle groups and make you expend more energy. When you're choosing or building a program, it's best to focus on compound movements. You'll get more work done in less time. When setting up a workout, compound exercises will be your primary movements. These should be your main focus, and will make up the bulk of your exercise routine. Many strength-training programs for beginners use compound movements only. This is to help build a solid foundation of strength before introducing accessory movements. If you're not training for a particular sport, this is a good rule to follow. However, you may find that as you progress with your basic movements, certain nagging issues—like poor low-back strength or weak glutes—will prevent you from progressing past those coveted beginner gains. This is when accessory movements come in handy. Accessory movements assist you in overcoming weaknesses, complementing main movements, or emphasizing one muscle group. The list of accessory movements is long (and even includes all the compound movements) and can get overwhelming. Don't focus on filling space. Only use exercises that enhance your program. Use your weaknesses and your initial fitness goals to help you figure out which accessory movements will be most beneficial. This is a bit tricky to figure out, so it's best to just stick to the basics. Most new-to-the-gym men and women don't think twice about how many pull and push movements they are doing. It's important, however, to balance your pull and push exercises. Most of us have naturally stronger push movements, and imbalance that can lead to bad posture and poor symmetry. There's no hard and fast rule when it comes to balancing push and pull exercises. It varies for individuals and the training goals. On the whole, however, you want more pulling than pushing exercises in your routine. Many beginners believe that the more they exercise, the faster they will reach their goals. Wrong, I'm afraid. Endlessly hammering your muscles will only leave you over-trained and really sore. When you begin working out, plan to strength train 2-4 times per week for 30-60 minutes. Space your workouts so your muscles are primed and ready to go each time you set foot in the weight room. Rest and recovery is just as (if not more) important as the exercises you perform. Exercise efficiently rather than for longer time periods. Compound movements and supersets are a great way to get the most bang for your buck. You'll burn more fat, get stronger, and grow more muscle in less time than you would spending two hours on your biceps and triceps. Resting between sets will help your body continue to lift the same poundage. Some methods, like supersets or circuits, require that you perform multiple exercise sets without rest, but most standard workouts allow a short rest period between each set of repetitions. Most rest periods are between 30-90 seconds. If your weight isn't heavy, then you should spend less time resting. You may find that, as you progress to heavier weight, you need to rest more between sets. It typically takes longer to recover your strength than endurance. When you're new to resistance training, it's difficult to figure out how much weight to lift. As an inexperienced lifter, it would probably be a bad idea to test your one-rep max (1RM). 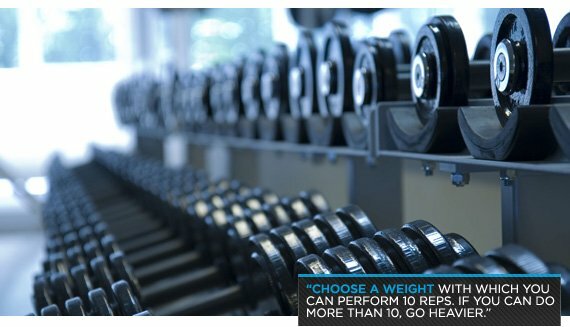 Instead, find a weight with which you can perform 10 reps. If you can do more than 10, go heavier. If you can't get 10, grab lighter dumbbells. This is your 10-rep max, which is much safer to calculate then your 1RM. Then, take this information to determine what weight to use for the reps prescribed in your workout. For instance, if you squat forty pounds for 10 reps and need to squat 6-8 reps per set, just take 60-80 percent of your 10-rep weight. For this example, you would use 25-32 pounds for your set. Round down to 30 if necessary. Once you determine the right weight to use for each exercise, set a goal to increase this weight as you progress. This is called progressive overload. The idea is to introduce new stimuli each week so your body is forced push beyond what it's adapted to doing. Here is a sample routine to get you through your first month of strength training.